Please join us for a fly fishing school. On Sunday, July 22, a Backwater Angler Guide will be teaching a fly fishing school that is ideal for beginners. If you’re planning on flyfishing Maryland, or anywhere else for that matter, this course is a great introduction to the sport. The school covers knots, casting, gear and fly selection. Class is held from 11:00 AM till 2:00 PM. Cost is $100 per person and includes the use of gear. A Maryland non-tidal fishing license and trout stamp is required and may be purchased at the shop with check or cash the day of the school. Class size is limited to 4 and pre-registration is required. Please give us a call at 410-357-9557 or drop us a line at info@backwaterangler.com to pre-register. This entry was posted in events on July 19, 2012 by Theaux Le Gardeur. The Gunpowder river is clear, low and flowing at 54 Cfs. #16 Caddis, soft hackle pheasant tails sized #14-16 and beetles in the #10 to #12 range and small streamers have been tricking fish in the catch and release section. Thanks to Scotty for the stream reports. Here is my brown caught on Saturday afternoon. They kept hitting but would easily get free on the smaller fly, I moved up to a #12 tan caddis and when it hit the water he hit it hard, I worked him of a few minutes to slow him down and landed him in my net. Great fighter, gentle with the hook removal and I placed him back in the water and he circled the rock for 5-10 minutes before he went back up to where I had caught him. Stellar weekend, we ran the Gunpowder from the dam down to the tail end of Masemore Rd. Water temp was 52 all the way down to the aft end of the Lefty Krey trail. Had seen a Golden trout off the Blue Mt Rd bridge last night while scouting. Probably 10″ or so. Nice 10″ brown off of Falls road off a #16 chartreuse worm. This entry was posted in fishing report on July 16, 2012 by Theaux Le Gardeur. 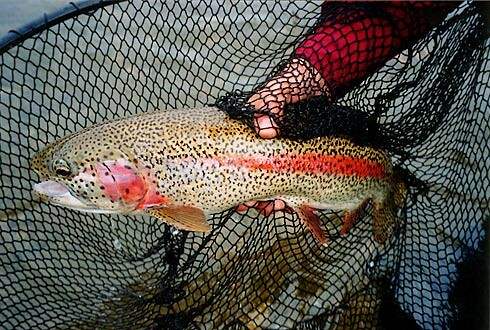 This leopard rainbow was released on an Alaska trip by Jack Cochran. We’ve had a quite a few anglers in this week checking off their fly fishing destination trip gear lists. Some of the goodies have included a fresh hat, big flies, short, heavy leaders, Lamson and Hatch reels, Airflo Coldwater fly lines, 4 pc G. Loomis NRX and Pro-4x models (in the 6 through 8 wt range) and Patagonia Rio Gallegos waders have been popular, must have items. This entry was posted in news on July 16, 2012 by Theaux Le Gardeur. The Gunpowder River is flowing at 74 CFs, is 54 degrees F and is clear. Tricos and foam beetles have been accounting for some bright fish in the catch and release section. We’re also seeing a number of fish looking up and taking small elk hair caddis sized #16-18 in the shade. The last of the sulphurs in the #22 range are coming off midday. Here’s to hoping that everyone’s power gets restored! This entry was posted in news on July 2, 2012 by Theaux Le Gardeur.